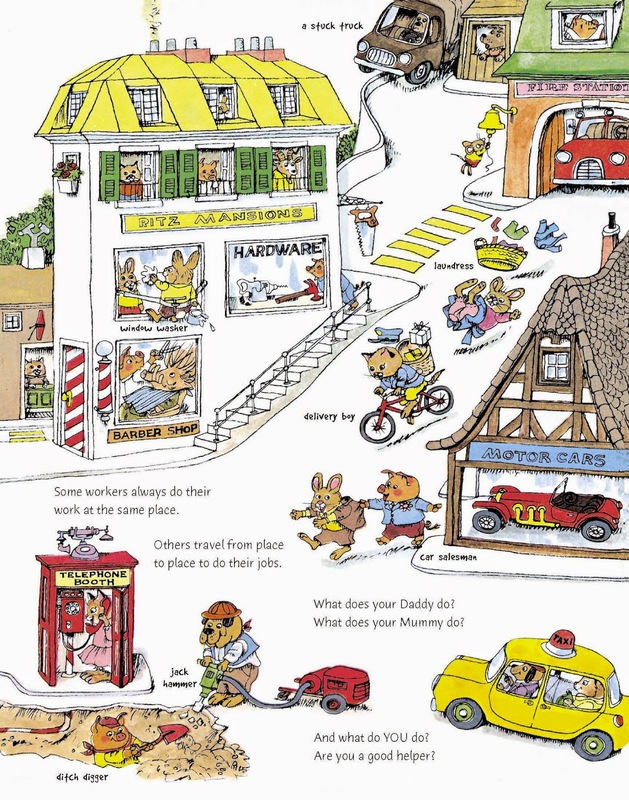 As a child, I loved Richard Scarry’s picture book What Do People Do All Day? Its large-format pages are crowded with brightly-colored drawings of pigs and bears and cats, all engaging in the fascinating work of grown-ups, with more than a few disasters thrown in. Construction workers toil under the streets, postal workers scatter envelopes above, and airplane pilots soar over it all. Scarry’s attention to minutiae—the used-car salesman physically restrains a fleeing customer, the laundress gets run over by the delivery boy and sends her laundry flying across the street—impressed my young mind: adults are very, very busy. Sometimes, being a pastor’s wife can feel like a page out of Richard Scarry. It’s hard to know where to look first. This church event is happening over here—Quick! Someone catch the leaning cake! That Bible study is happening over there—Watch out, Mrs. Bear, your leader’s guide is blowing across the street! These people are coming for dinner—Does anyone smell smoke coming from that stove? Those people are fleeing their marriage—Look! Mr. Bear is going to grab their shirts and try to keep them together! 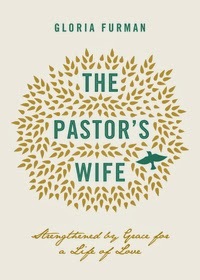 Enter Gloria Furman’s forthcoming book The Pastor’s Wife. From its serene, leaf-twined cover, to its expressed thesis—“wives of ministers need encouragement and refreshment in the Lord, and we find that hope and help in the gospel”—this book is an anti-Scarry. With a large, pink eraser in her sympathetic hand, Furman blurs the frantic church hallways and manse living areas. She sends the quarreling members and impending temporal disasters to the background for a minute and draws a new picture in the foreground: the good news of Christ died and risen for sinners. Pastors' wives are very, very, very busy. They really need Jesus. Furman’s book is helpfully divided into three sections: Loving the Chief Shepherd, Loving an Under-Shepherd, and Loving the Bride of Christ. With a warm tone and rich theology, Furman focuses pastors’ wives on the heart of the matter. True to her anti-Scarry style, this is not a book of fast-paced minutiae—“I realize that your time and energy are in high demand, so I want to honor that and drill down to the things that matter and let you draw out the implications for your unique life and ministry”—it’s a book of essentials. Who do you love? And why? The privilege of participating in Christ’s fullness, filling all in all as more and more people across the globe worship him as the one true God, is why you are here. This is true whether you are in Iowa City, Bangalore, Abu Dhabi, or Juarez. Even on a mundane Monday morning our hearts can be thrilled with the prospect that included among the gifts Jesus gave to his church are your pastor-husband to serve and you to help him serve—for the building up of his body. It throws everything into perspective of the big picture when we remember that Jesus ordained that this body building has a massive, Christ-centered goal: that the church would attain the unity of the faith and of the knowledge of him, to mature manhood, and to the measure of the stature of his fullness. The Pastor’s Wife is a survival manual of the most glorious kind. Sweeping away the busy clutter, we are left with a sense of what is most vital—for pastors’ wives and everyone else. What do pastors' wives do all day? If you read this book you'll know the answer, simple enough for every day but rich enough for a life-time. Pastors' wives delight in Christ.